Nearly every healthcare facility in the United States receives some sort of government funding, which is vital to providing proper care for patients — but that funding is also conditional. Government funding involves multiple organizations that all have different standards healthcare facilities must uphold. One of these includes passing audits performed by the Centers for Medicare & Medicaid Services (CMS). With this type of audit, healthcare facilities who commit too many condition level violations will be placed on a 90-day track towards termination of their right to be reimbursed for treating Medicare patients. Currently, there are 44 million beneficiaries receiving Medicare, meaning that could be a significant monetary loss for healthcare facilities. What are these common safety regulations and how can you prevent a violation? Let’s take a look. You see sprinklers in practically every building you enter. 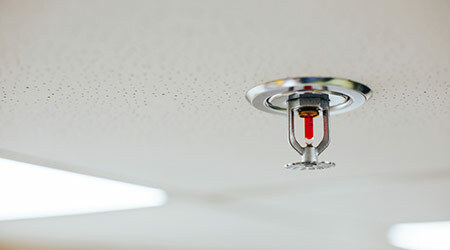 They’re a fairly basic safety standard in numerous industries, but did you know that if the head of a sprinkler is not properly maintained, it can malfunction? Poor sprinkler head maintenance can cause a variety of issues, such as build up of dust and debris, freezing and corrosion. While these may not seem like traumatic problems, dirty sprinkler heads can re-transmit bacteria and release dust and other germs into the air for everyone to breath. In a healthcare facility, this could be deadly to immunodeficient patients. Severely compromised sprinkler heads will require replacement, but this process can be expensive and time consuming. Luckily, there is an alternate option: cleaning sprinkler heads with compressed air or a vacuum. Providing proper maintenance to your sprinkler heads is a fairly simple and efficient process that could save you from safety violations in the future. According to data collected by the U.S. Fire Administration, 22 percent of unconfined, larger and more serious fires in hospitals over a span of three years were caused by electrical malfunctions. Electrical violations can range from simple issues, like failure to regularly test fire alarm systems, to very complex problems. Things can get complicated when you consider a more complex setting. Picture an ICU room with large machines and multiple power cords that have taken over every electrical outlet in the room. When an outlet is overloaded with multiple currents, malfunctions can occur and often cause a fire. However, if all of these machines are necessary, how can this issue be prevented? One way is through the use of technology. A recent report cites that today’s hospitals are, on average, two decades old. Aging hospitals and healthcare facilities, alongside progressions in technology, quickly creates a gap in what facilities are able to support with existing infrastructure and without expensive electrical retrofits. Companies like FLI Charge, for example, produce electrical charging pads that can offer the ability to power multiple devices at one time, using a single outlet to make the scenario safer. Healthcare facility employees must be educated consistently on the location and use of fire alarms and fire extinguishers. These devices are the first line of defense against harmful incidents and should be treated as one of the most important safety precautions. This is also one of the easiest safety standards to meet. The square footage of your facility will determine the number of extinguishers and alarms you need in order to ensure easy access to your staff and patients. Healthcare facilities are supposed to be a safe place for staff and patients, where everyone can receive the proper care to maintain a healthy lifestyle. However, if safety standards are not met and funding is eliminated, these facilities may find themselves with limited resources, which ultimately could lead to closed doors. Billy Findley is the vice president of general products at Koorsen Fire & Security.